Frank Hyde "The oldest rider on the youngest horse". 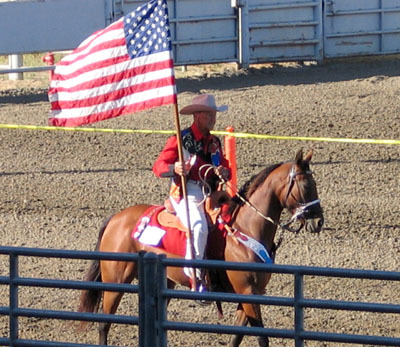 He proudly carries the American Flag for his 30th year. The first time that I saw my uncle ride was at the California Gymkhana Association State Championship, just after his 90th birthday. The year before, I was given my first horse, an old sway back mare. Someone had given me this horse because they said that she was crazy. My mom told me to call my uncle to see if he could help. Not completely knowing the history of Uncle Frank's life time achievements, I hauled my new horse eight hours south. I'm so glad that I did. The first show that I entered, I won "high point" in my division. I was hooked. Only a man like Frank Hyde could inspire me to learn to ride at the age of 41. He helped me believe in myself. I trust him completely when it comes to knowing what to do to keep my horse under control. His stories inspired me to write this song. This is the first song that I've ever written and recorded. He said at one time that he was good at yodeling, so I tried that too. As a surprise, I was going to sing this for his 91st birthday at State Championships in 08. A new rating rule, adopted by the "Board", kept the "Hyde's Trybe" from competing this year. I hope those of you who know my uncle, and those who don't, enjoy the story of this incredible man's life. I'd like to thank: Thom Bentley (mandolin), Hugh Hoeger (bass), and Brad Bauer for recording this.